This spot has been a place of Christian worship for over 1300 years since Osric, an Anglo Saxon prince founded the site of the cathedral in 678 AD. By 1066 there was a thriving monastery here which by 1089 was being extended to the magnificent abbey church we see today. In 1216 Henry the Third was crowned here and in 1541 the Abbey church became a cathedral after extensive building alterations. 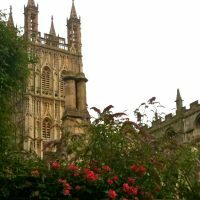 Set in a beautiful square in the heart of the county town of Gloucester the stonework and carvings are magnificent and provide the perfect sanctuary from the busy town centre just a few yards away. This tranquil spot oozes a sense of spirituality and spirituality should be an essential part of everyone’s lives regardless of religion, culture or creed. Spirituality is all about connecting to forces that are bigger than all of us and recognising the small part each of us plays in the bigger scheme of things.